Frontline medics and providers delved into the military's latest paradigm shift of traumatic brain injury assessment and treatment March 7 at the Warfighter Brain Health Training Symposium at Madigan Army Medical Center. "The need for training this year is greater than most years because just about every standard system that we use in our assessment and management of TBI are being overhauled based on the latest state of the science," said Maj. (Dr.) Joseph Kamerath, the director of the TBI and Intrepid Spirit Center at Madigan. A warfighter brain health memo issued last fall by Patrick Shanahan -- acting Secretary of Defense, when he was serving as the Deputy Secretary of Defense -- established a commitment to understanding, preventing, diagnosing, and treating TBI in all of its forms, and the 2018 Defense Authorization Act also called for expanding blast research. "We're in an environment where we understand that the effects on readiness are greater than we ever thought, the numbers of servicemembers sustaining TBI continue to be high despite the decreased operative tempo, and that we need to put a bigger emphasis on preventing TBI, and when people do have a TBI, mitigating the effects to maximize not only their wellness but our military readiness," Kamerath said. He spoke to an audience of primarily frontline providers such as primary care managers and medics, who he called "the backbone of far-forward military healthcare." Researchers presenting at the symposium emphasized the key role of medics in early detection and treatment of TBIs as being influential in the long-term health of servicemembers. Although years past the height of the wars in Iraq and Afghanistan, TBIs are still a substantial issue affecting readiness, with nearly 18,000 new TBI diagnoses in the Department of Defense in 2017. Current research is developing evidence that the long-term symptoms of mild TBIs, or concussions, may be more prevalent than previously thought. "We used to say 85 percent are going to be fine; 85 percent of mild TBIs are (going to be) 100 percent better," said Kamerath. However, he said researchers are now finding that a certain percent of that 85 percent are experiencing more subtle symptoms, such as changes in vision, headaches, sleep and concentration. "One of the really unique things that's been recognized is that in the coming several months after sustaining a mild traumatic brain injury, a soldier or a college athlete is twice as likely as their peer to sustain a lower extremity musculoskeletal injury be that hip, knee or ankle," he said. A potential reason could be that the subtle balance deficits caused by a TBI may make people more likely to sustain an injury. From there, the math to TBIs affecting readiness is simple. 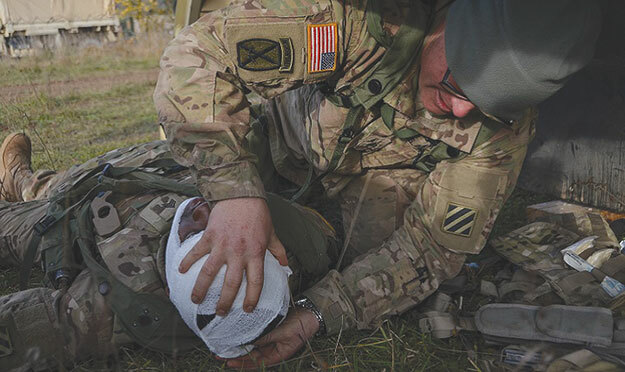 Twice the rate of musculoskeletal injuries, which are one of the greatest health concerns which affect warfighter readiness, means that even the subtle mid- and long-term effects of TBIs could have real mission impacts. In other words, if readiness matters and TBIs affect readiness, then understanding the best way to assess, treat and mitigate the risks of TBIs also matter, Kamerath said. "We are working to develop the best ways to make sure that they get back in the fight without sustaining injuries and maximize the readiness of our force," he said. One of the ways to better treat TBIs is to get patients to specialists faster. Historically, TBI specialty clinics cared for patients living with the chronic effects of TBI, who may have been referred after months of related symptoms. Now, the standard is that if a patient experiences an uncomplicated TBI yet is not improving seven days later to refer them to TBI specialists, who in turn are committed to seeing patients within seven days of the referral. "With more and more evidence suggesting that early rehab can be helpful to mitigate long-term effects, the push now is to change our model," said Kamerath. "This is really the right way forward to get people in early, getting them in to see the appropriate specialist early, so that they can get the care that's needed." Other speakers addressed the long-term effects of TBIs, including the increased levels of disabilities experienced by blast concussion patients compared to those with non-blast TBIs one year after their initial injuries. Dr. Christine MacDonald, an associate professor of neurological surgery at the University of Washington, explained that her longitudinal study found that 74 percent of concussive blast patients still experienced health reductions five years after their injuries. The best early predictors of these long-term reductions include being at an older age at the time of injury, having a TBI diagnosis, experiencing greater depression symptoms, exhibiting a slower reaction time, and demonstrating less word generation (aka verbal fluency). Another study presented by Dr. Jesse Fann, a professor of psychiatry and behavior sciences and adjunct professor of rehabilitation medicine and epidemiology at the University of Washington, found a long-term increased risk of dementia for people with TBIs. "The impact of a TBI is higher when you have a TBI earlier in life," said Fann. He shared that more severe TBIs also increase the risk of later developing dementia. While only 0.4 percent of the people studied had dementia due to TBI, that statistic is still significant given the large number of people who eventually do suffer from dementia, he said. While the symposium included long-term potential effects of TBIs, it also offered medical providers tools that they can use now to better assess TBIs with the hope that better detection leads to better treatment. While the Military Acute Concussion Evaluation is the standard for TBI screenings, the older algorithms are being replaced by the Concussion Management Tool, according to Kamerath. It is also incorporating the Vestibular/Ocular Motor Screening. Other new tools include the BrainScope One Device. "When we get patients with TBI, our biggest concern is if it's life-threatening now," said Maj. Nicholas Koreerat, a clinical specialist in orthopedic physical therapy. He briefed on the BrainScope One Device, which detects if bleeding occurs in the brain after a traumatic brain injury. Before the military began using it, the options to treat suspected brain bleeds downrange were to either "wait and see" or medevac the patient for a CT scan. However, if servicemembers are medevaced unnecessarily, operational effectiveness decreases as aircraft are diverted for unneeded medevacs. Due to its high rate of sensitivity, the BrainScope increases the effectiveness and accuracy of determining treatment for patients who may experience brain bleeds, Koreerat said. Another frontline screening tool now available is the Vestibular/Ocular Motor Screening, presented by Maj. Katrina Monti, the senior physician assistant for the 1st Special Forces Group (Airborne). The six-minute screening tool assesses headache, dizziness, nausea and fogginess following specific maneuvers used to cluster TBI-associated symptoms. Monti explained that 60 percent of concussions result in these vestibular symptoms, and that patients tend to have poorer outcomes and longer recovery times with these symptoms as well. "The big takeaway for me from that presentation was just how easy it is to implement some of the new tools that are coming out from the research that we're seeing in the field, in deployment or other real-life settings, not just in clinics and hospitals," said Kasey Zink with the Geneva Foundation, which funds research like the VOMS tool. Others learned that just because TBI assessment tools may be easy to use, other factors may serve as barriers to screening. In fact, underreporting mild TBIs occurs in the field because of lack of awareness -- servicemembers may not know which symptoms are related to concussions -- and because they sometimes don't want to be taken off their teams, even temporarily, for medical observation or treatment, said Monti. The key, she said, was in part greater education of the troops on mTBIs, to include awareness that earlier reporting can lead to faster improvement of symptoms and earlier return to duty.